Being a woman in her early thirties, I’ve been to numerous baby showers and no matter the decor, there is always a common theme, duplicate shower gifts. Even those guests that study the mommy-to-be’s gift registry carefully have been in that awkward position of watching as an identical match to her gift is unwrapped. I absolutely hate this moment. It’s uncomfortable for everyone involved. 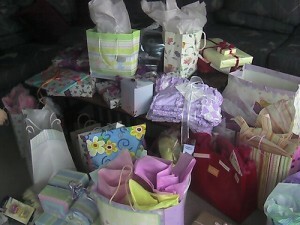 The guest of honor doesn’t know what to say, the gift givers shout out simultaneously, “I used the registry! Something must have happened,” and the other guests start rattling off bizarre untruths about how great it is to have two mobiles. I’ve made a solemn vow to myself that I’ll never be one of these unfortunate gift givers who knows, beyond the shadow of a doubt, that after all the time it took to find the perfect present, it will be returned. Still, I’m not a fan of just giving money, because I like the ooh’s and ahh’s my gifts get when their opened and I want the mommy-to-be to know that I gave some thought and consideration to the needs of her family. The best way to insure that you’re gift will be unique is to give something homemade. Mom’s love personalized blankets, quilts, nursery decor and ornaments, but alas, I wasn’t blessed with gift-quality crafting skills. If you’ve got ‘em, use ‘em! I have to rely on purchased baby shower gifts to get by, but there are still ways to shop without getting burnt by the “how nice, I’ve got another…” bug. I’ve never liked just giving cash in a card, because while one size does very much fit all, it lacks a personal touch. With this in mind, I generally give the new mom and baby a cute stuffed animal or rattle attached to one of the following gift cards. Choosing the right baby shower gift can be stressful for a gift giver. Giving a special gift card shows you care, but prevents you from any awkward moments when your enjoying some pastel pink baby shower cake.